In our previous tool blog we showed you how to use the Riskiest Assumption Canvas. Here’s the thing: once you’ve found your riskiest assumptions, you’ll need a way to figure out how best to test and measure those assumptions in a quantitative way. The Experiment Canvas provides a straightforward way to break down your assumptions into measurable, observable, experiments. The purpose of the Experiment Canvas is to design the right experiment at the right time, in order to facilitate a team to have the right conversation(s). With the Experiment Canvas, it’s easy to design a well-defined experiment: start with identifying the current riskiest assumption, then specify a clear, falsifiable hypothesis and experiment setup. After running the experiment, check the results and plan your next steps. It’s that easy! Your hypothesis is a statement you believe to be true about your riskiest assumption. Write it down before you run the experiment. It’s too easy to change the conditions afterward to make the data fit, and this robs you of valuable insights. Quantify your hypothesis. How many customers will do it? How many times? In what time frame? It’s okay to put some constraints on this in order to deal with your own bandwidth; just specify that up front. The metrics you define need to be actionable and accessible. Link the numbers back to the assumption you are testing. Why does having 10 positive results validate your assumptions? Specify any qualitative outcomes and variables. What different answers you are expecting? How will you cluster them? Armed with this hypothesis, you’re ready to start your experiment. Track the data immediately and write everything down, so that later you can check if you interpreted the results correctly. Above you see the Experiment Canvas of SpaceX. To see all the risky assumptions, check our previous blog. 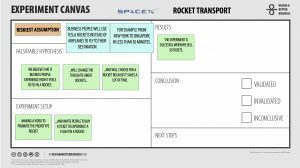 The riskiest assumption of this canvas is ‘Business people will use rockets instead of airplanes to fly to their destination’, for example from New York to Singapore in less than 30 minutes’. What do we believe about this assumption? 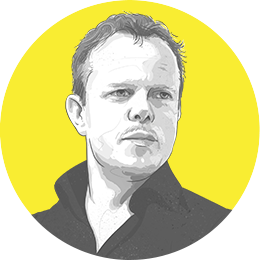 That is our falsifiable hypothesis: we believe that if business people experience how it feels to fly in a rocket, it will change their thoughts about rockets and they’ll choose to fly via rocket because it saves a lot of time. To validate this hypothesis, it is important to run an experiment where people can really experience the hypothesis. Beware: a simple survey with the question, “are you interested in using a rocket?”, is not enough. People will not be able to give a well-founded answer without experiencing something. So maybe they say, “yes I am interested in using a rocket instead of an airplane”. But this is an answer based on what people think, not what they will actually feel and do. After formulating the hypothesis, describe what your experiment will look like, and what the desired result is. In this case, we will make a video to invite business people to buy a ticket and experience a rocket flight! Our experiment will be successful if we sell 50 tickets. The purpose of the Experiment Canvas is to design the right experiment at the right time, in order to facilitate a team to have the right conversation(s). With the experiment canvas, it’s easy to design a well-defined experiment: starting with identifying the current Riskiest Assumption, then specifying a clear, falsifiable hypothesis and experiment setup. After running the experiment, check the results and plan your next steps. Do you need to pivot, persevere, or redo the experiment? 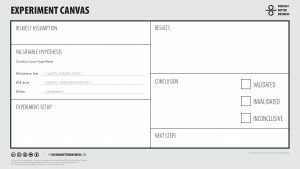 In our next blog we will dive deep into the next step: the Validation Canvas. Interested in using the Experiment Canvas? Use our step-by-step guide and download the canvas. Need help designing a better business? We’re here when you need us! Do you like our tools? You can experience ‘Design a Better Business’ live! Feel the uncertainty in your bones as we take you on a design journey. Experience and learn what it means to think and work like a designer. Check our upcoming events in New York City and in Amsterdam.